We’re glad that all the vacationers out there have had weeks full of sunny weather. But as for the farmers… we need some serious rain! All the thunderstorms of the past week passed us by, and the soil is thirsty. A lot of the crops are showing signs of stress, but the crops that we are lucky enough to have irrigation on are holding up well. Saturday was Sayni and Sobha Ram’s final full day on the farm. We will miss Sayni’s infectious excitement when talking about women’s empowerment, and we will miss Sobha Ram’s reliable presence. Our CSA community came together in a remarkable way to support Sisterhome, the orphanage and women’s education program that Sayni runs in Nepal. If all the pledges come through, we will be sending Sisterhome over $3500 every year for the next five years. This will make a remarkable impact in her community. I heard this week from an American woman who has been to visit Sisterhome over the years. When she heard what we raised she wrote to say “What a difference it will make for many. I have heard women sing songs that learning to read was for them like taking blindness from their eyes.” Thank you to all our members who make this community what it is. Even if you were not able to contribute directly to Sisterhome, your participation in the farm helps make all of this possible. If you signed up to pick up your blueberries on Sunday, remember that the 9th is your pick-up day! Berries will be available from 10:30-11:30 am at the First Universalist Church in Rockland and the $38 per box can be paid by cash or check (made out to HCF). Have a wonderful week, and enjoy the mid-season bounty! 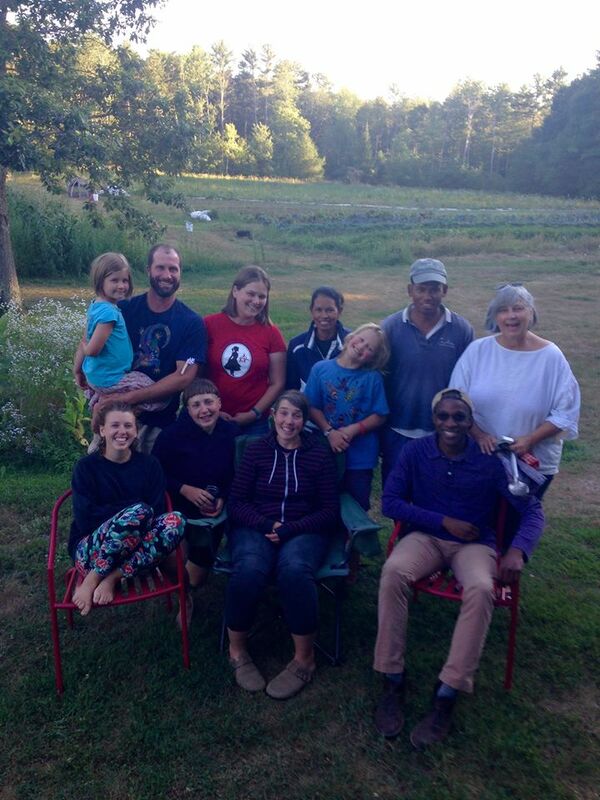 Our final farm dinner with Sayni and Sobha Ram. Clockwise from upper left: CJ, Bill, Reba, Sayni, Eli, Sobha Ram, Pam, Daniel, Katie, Lindsey and Julia.